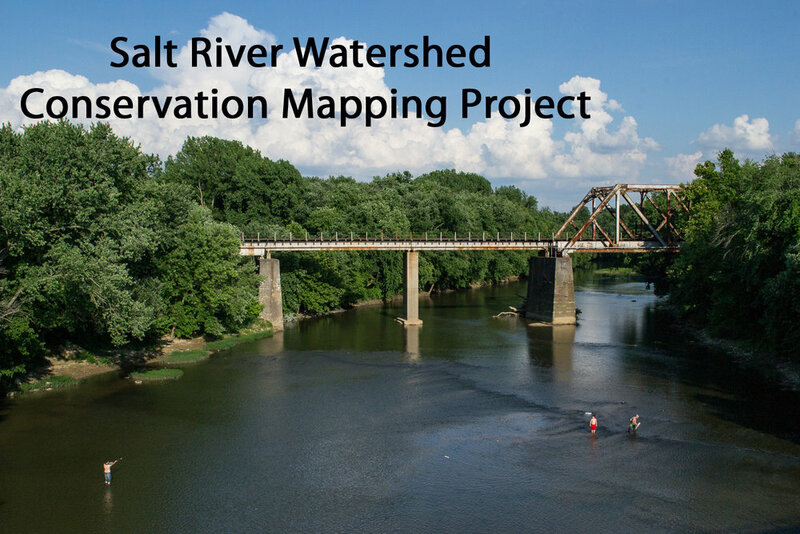 The Salt River Watershed Conservation Mapping Project is a cooperative effort of over 25 organizations and agencies interested in improving the public benefits of conservation work in their communities by improving the status of conservation mapping resources for the region. This project is funded by grants & donations and is not for profit in any way. The goals are to improve research & benefit the community. This webpage is provided as a reference for informational purposes. The collaborative Salt River Watershed Conservation Mapping Project got underway in March 2017. For about two years prior to the current project, interested groups met for informal discussions aimed at increasing collaboration to achieve large landscape conservation in Kentucky. In late 2016, this collaborative group raised money to support a conservation mapping project. The Louisville-Jefferson County Environmental Trust was awarded a grant from the U.S. Army Corps of Engineers to provide technical expertise by the GIS professionals at the Corps to complete GIS-based mapping work. The grant from the U.S. Army Corps was matched with funds and in-kind services from several of the participating groups. An additional grant from the U.S. Fish and Wildlife Service was used to hire a project manager to work on behalf of the collaborative group of participating organizations. The grant from the Army Corps and the grant from USFWS started in March 2017 and will run for one year. Mouth of the Salt River (at right). Photo by Susan Hamilton. Beech Fork in the Salt River Watershed. The Salt River Watershed Conservation Mapping Project is a cooperative effort of over 25 organizations and agencies interested in understanding and communicating the public benefits of voluntary conservation measures in the watershed. The project will improve and expand conservation mapping resources for the region. The participating groups will use the maps to ensure that future projects they pursue offer the greatest benefit to the people of the region by supporting clean water, clean air, productive farmland, important wildlife habitat, healthy communities, outdoor recreational opportunities, strong local economies, and the overall desirability of the region as a place to live and work. The first phase of the Conservation Mapping Project had a one-year timeframe, and resulted in a series of maps and compiled database relevant to conservation efforts. As we build on the initial one-year first phase of the project, the participating organizations will be able to utilize the maps and data to set their priorities for projects that fulfill their organizational missions. Subsequent phases of this collaboration will involve a greater degree of public outreach and involvement in how the maps are used and which conservation projects are implemented. This Project is producing tools that each participating group can use to increase the efficiency and impact of its conservation work and public benefit mission. developing funding proposals for future conservation projects that benefit landowners in the watershed, such as to create a Regional Conservation Partnership Program. This collaborative project will help ensure that communities, landowners, and farmers have all the tools available to make informed decisions to best accomplish their conservation goals for their properties. By compiling data into conservation mapping products, this work can also provide information that can help community planners and developers make informed decisions to enhance regional economic vitality and quality of life, while avoiding costly environmental and social issues. Approaching the Salt River from Floyds Fork. The first phase of the Salt River Watershed Conservation Mapping Project wrapped up in April 2018, resulting in a GIS database and a series of maps that can be used by each participating organization or agency to do conservation planning and project selection. These maps will show resources that are worthy of protection, as well as other data relevant to targeting conservation efforts to the maximum benefit of people and the environment. From left: Mark Wourms of Bernheim, Ben Miles of Shire Environmental, and Kurt Mason of Natural Resource Conservation Service. Photo by Susan Hamilton. A second phase of this project is expected to begin in earnest this summer (2018). This “Phase II” would involve a greater degree of public outreach and interaction, and the scope of work is still under discussion. Eventually, these collaborative efforts and the maps produced will help ensure that as our region grows, the ensuing development recognizes the value of green space to benefit quality of life and increase property values. The project will provide landowners better information to help them achieve their goals for long-term management for areas rich in natural and cultural resources. Ben Miles of Shire Environmental was hired to serve as Project Manager for the conservation mapping project, working for the collaborative group of organizations to coordinate work with the GIS professionals at the US Army Corps of Engineers. This webpage is provided as reference to our conservation mapping project.